Meet Gyzmo, a rare lavender lil boy! Meet Stella a beautiful cream dilute girl. We made it home ok.. I took a few pictures last night & went strait to bed! We were so tired!!! She slept all the way through the night! She went potty on the pee pad!!! She is really smart! She knows her name already!! Smart little thing! Thank you so much! She is exactly what I have wanted for so long! I will be contacting you for another one maybe next year!!! I love her! She is so spoiled! Here are a few pictures. I'll keep in touch so you can see her grow up!! Meet Maddie! A sweet Cream Dilute girl. 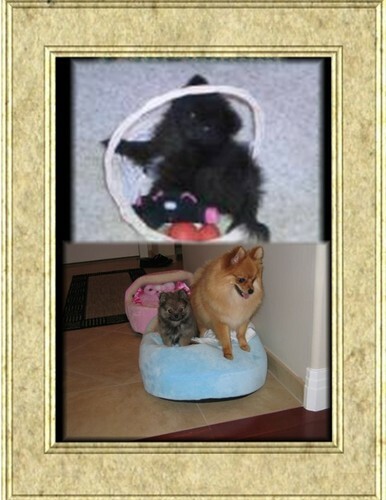 She is pictured here with her Black/Tan brother Max who is also from Sharp Poms! Bridget. here are some pictures of Maddie and Max. He is in love. She gave him kisses right away, it was so cute. She is absolutely adorable and so good. Thank you so much, we just love her. Meet Boo Boo a beautiful and very tiny Chocolate Pom! This is the sweetest picture with his new mom & dad! 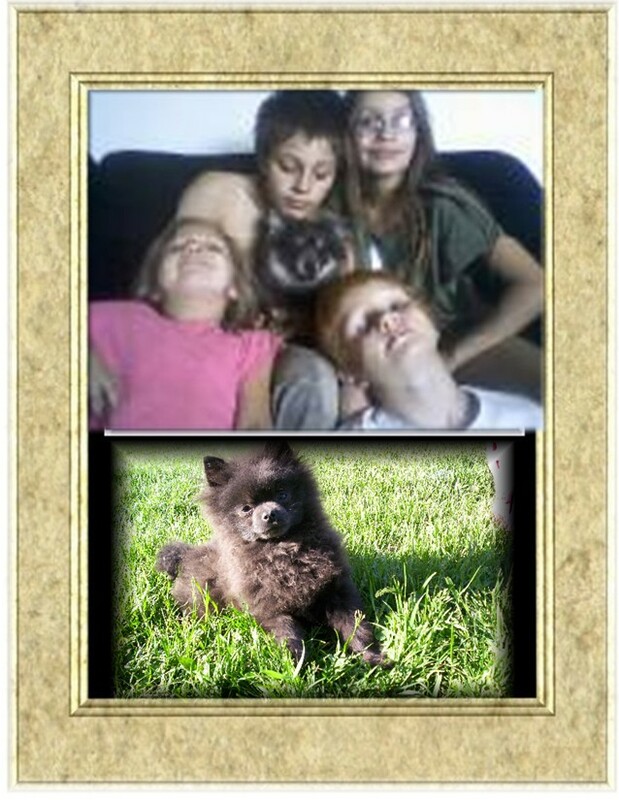 MEET PEKOE A BEAUTIFUL LIL GUY LIVING IN LAKE HAVASU AZ WITH HIS ADORING FAMILY, THE JACOBSEN'S! It looks like you are expecting little ones again and know you will be very busy, but we knew you would still be interested in how little Pekoe is doing. He is an absolute little doll!!! He just had his third set of shots yesterday and he weighs 3.2 lbs....he is growing up fast! He and Pandora are "best buddies" and play and do everything together...it's so wonderful to watch them! He has been to the lake twice on our pontoon boat and he loves to ride and play on the floor...we are so amazed at how well he adapts to different situations! His next learning experience will be swimming in our pool now that the weather is really warming up...we have a beach entry and he loves to stand and "paw" the water...so cute!! I have to say, he is definitely a very smart dog and we are totally in love with our little one! We are so happy that we chose Sharp Poms for our new puppy and really want to thank you so much for the incredible little pom we have! Your advice and help was so wonderful and made this such a positive experience!! 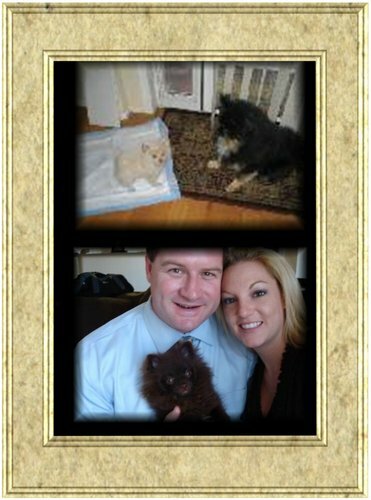 We will definitely recommend you to anyone looking for an exceptional pomeranian puppy! We can really tell that he had a wonderful entry into this world....thank you again!! MEET NALLA A GORGEOUS ORANGE SABLE BABY GIRL LIVING IN CO WITH HER LOVING FAMILY. She arrived!! When we got to Continental Cargo a group of men were fawning all over her. :) It took a bit to coax her out of her crate but, once she came out she started hopping, sniffing, and licking my hands. She wanted to sit up high on the way home so, she could look at out the windows. When we came home I brought Simba outside to see her. Right away, he was afraid but, within a few minutes they were running around the yard. They have really taken well to each other. She would not take her nutrical but, she did eat a little piece of food. She went poddy as soon as we got her home. She walked right over to the poddy pad so, I am not sure if that is what you were using but, she was so smart. We took some video and photos that I will send later tonight. Thanks again, she is so beautiful, smart, and sweet. 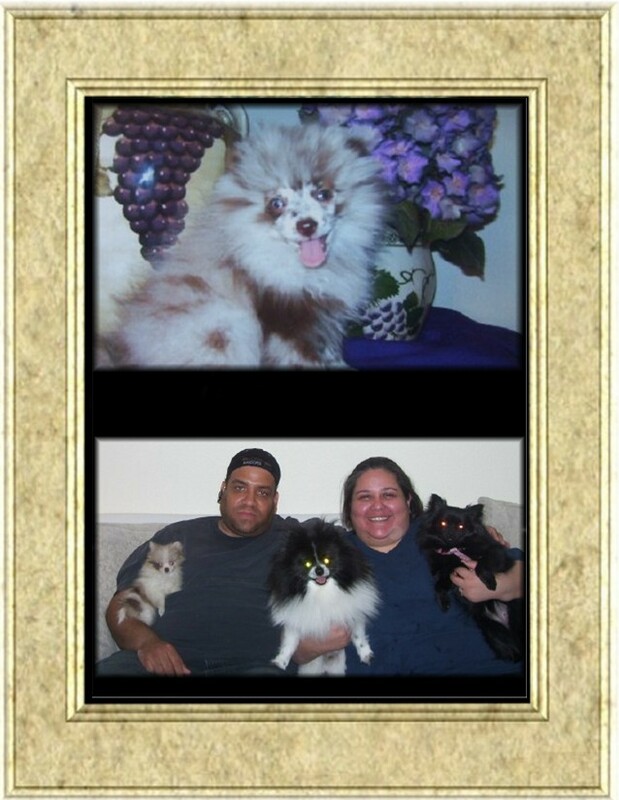 Meet Protege an adorable Blue & Tan boy living in AZ with his new family the Flemings! Meet Sashi, a gorgeous little Blue boy living in Canada with his new mommy Reehana! and starting to grow his coat. loves going for car rides. 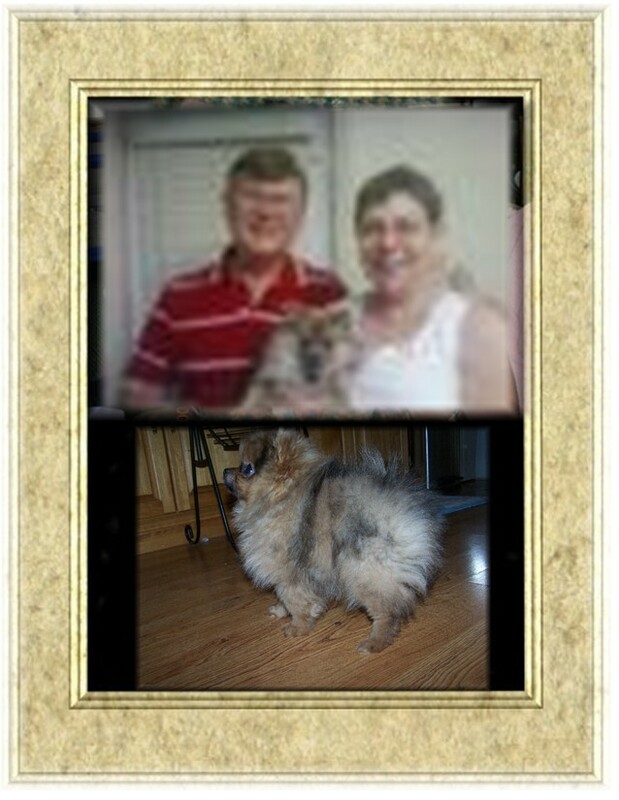 Meet Foxy Bleu a beautiful little Blue Sable girl living in AZ with her loving parents, The Calleo's. Meet Chilly a beautiful Red Merle baby girl living with her mommy Diane! Usually you respond to emails and I know I sent the last one while you were gone (sorry to call you by the way when you were on vacation didn't realize that till I got home and sent an email). Anyway, I wanted you to get the update on Chilly, she did great with her shot and weighed 2lbs and 2ozs. They all loved her at the vets and thought she was the cutest thing (well she is! 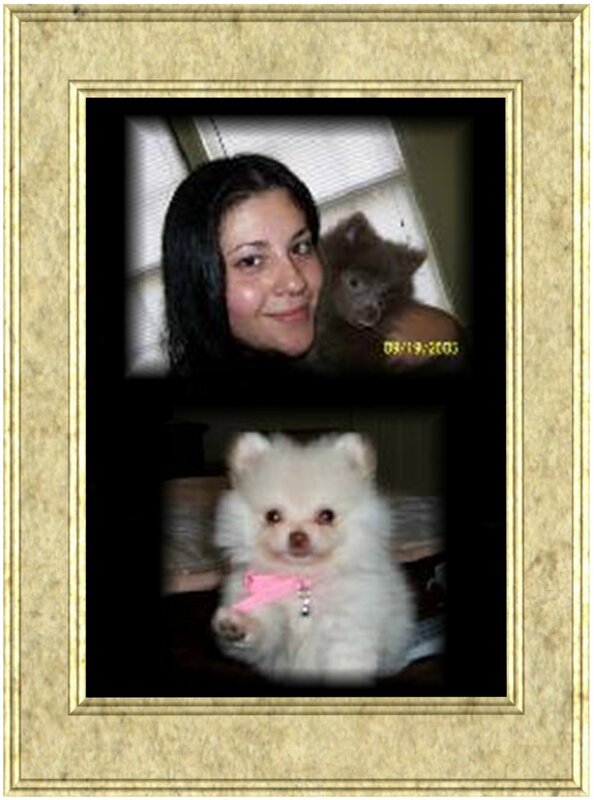 ), and I gave your web site to the vet tech there who said she has been wanting a pom. Chilly is a crazy girl! She likes to play in her water dish and splash all the water out, so now I have to put a towel under her water bowl for when she decides to be silly! :) She always comes when you call her name and is just a little bit of sunshine! Meet Sharp's Frank-Sin-Atra a blue eyed Lavender/Chocolate Merle living in Las Vegas with his wonderful new mommy Noela! Here are some pictures of my little guy, Sharp's Frank-Sin-Atra. His coat is so thick and he is now a light lavender with dark burgandy markings. He has the best disposition.Frank is loving and cuddles. He has barked a total of 3 barks in all the time I have had him. My older yorkie has fallen madly in love with the little guy. Everyone at the Vet squeals out loud when they see him!!! " I have never....look at the color!!!! Oh he is beautiful! Frank knew to pee on his paper from the day I got him. You did a great job teaching him and socializing him. My yorkie loves him, I love him too! Se is so adorable and tiny, we love her so much!